Broad Spectrum Pest Control Starting At $36! Use Beneficial Nematodes to Control Grubs, Fungus Gnats, Fleas and Over 200 Other Soil Developing Pests! ARBICO's Beneficial Nematodes are live microscopic organisms (non-segmented round worms) that occur naturally in soils throughout the world. They parasitize insect pests that have larval or pupal stages of life in the soil; however, they have been known to parasitize above ground stages of adults, nymphs and larvae. Beneficial Nematodes can be used in backyards, flower and vegetable gardens, lawns, fruit and nut orchards, vineyards, greenhouses, row crops, pastures and more. Use the beneficial nematode selection chart to choose the correct species of nematode for control of the pests you are dealing with. Application instructions, effective temperature ranges, storage information and more can be found in the Beneficial Nematode FAQs. 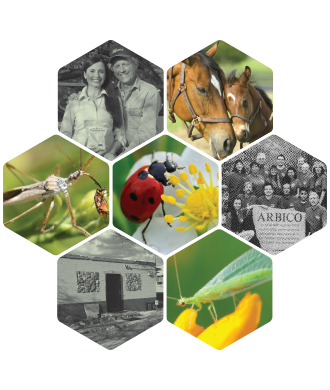 ARBICO Organics' line of Beneficial Nematodes PRO are certified for use in organic production. They are OMRI listed and delivered in a non-synthetic wettable powder designed for use by both residential and commercial users.